The Red Stare is a really unique game, in which you play as an American agent in the 50s which has been given a task to gather evidence on his neighbors in order to uncover a communist spy among them. You do all that operation from within your apartment. You get important intel from your phone and fax machine in the house and use your advanced Polaroid-like camera to take pictures and send them to the agency in order to try to prove suspicions and reveal the spy. This VR game is free-to-play. 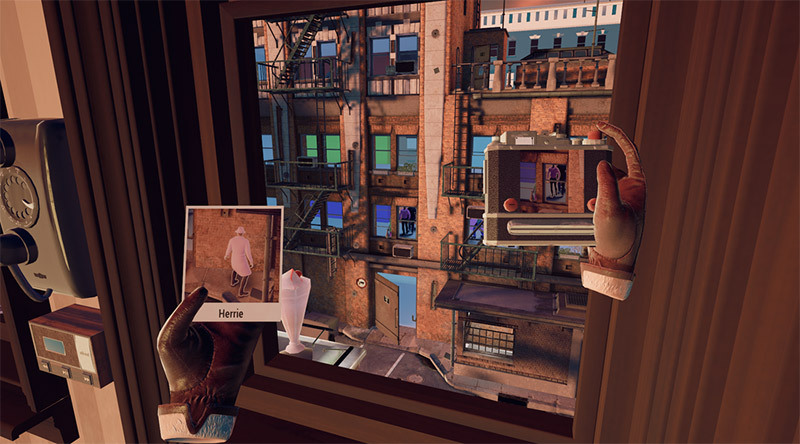 The Red Stare is a really unique and interesting VR videogame, in which you play as an American agent in the 1950s which has been given a task to gather evidence on his neighbors in order to reveal a communist spy among them. You do all that operation from within your apartment. You receive important intel from your phone and fax machine in the house and use your advanced Polaroid-like camera to take pictures and send them to the agency in order to try to prove suspicions and reveal the spy. This is exactly the type of game that I was really looking to play in VR. The idea reminds me of the game Private Eye VR, but it plays quite differently. In this game, you'll spend your time entirely from within this apartment where you'll do all your detective work. You'll gather important clues, observe and learn the behaviors of each of the suspicious characters, take pictures that might help to frame the suspicious person and complete the assignment successfully. I really enjoy playing VR games where you get into the shoes of a specific real-life job. Of course, nothing is more exciting than getting into the shoes of a secret agent, being lucky to get such an important high-profile task. 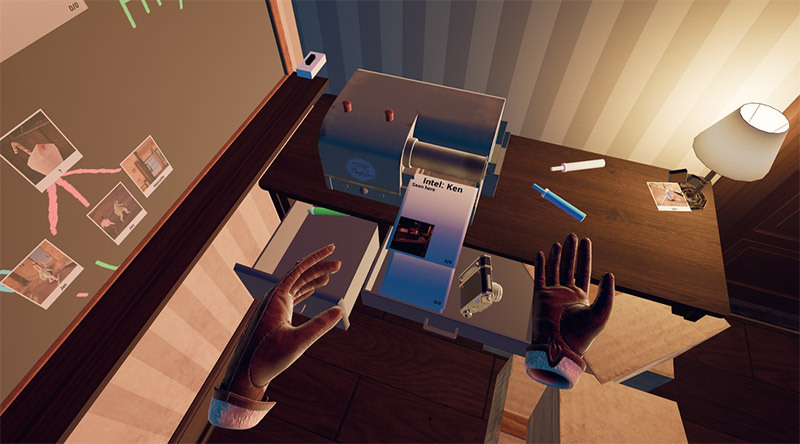 I always enjoyed watching detective TV series and movies since I was a child, but now in VR you can actually get to be that person, so I'm very excited to see such a game coming to VR. I really like the use of the digital camera as an important in-game accessory which you can use to take pictures of suspect and gain more information about them. 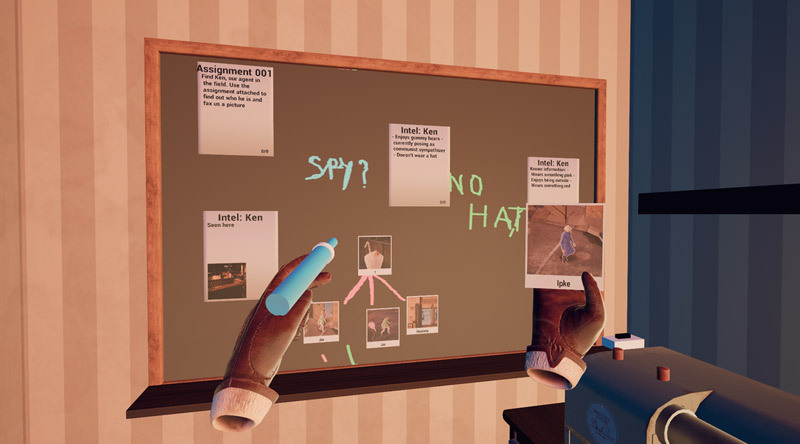 There is also that famous detective crime wall where you pin all the important evidence and picture clues and try to make a sense out of all that information. I do think it would be even more exciting in the communist was played by another real player, so that player would have been given some tasks as well and he needs to finish his task before being detected, like in the game SpyParty—this would be so cool! 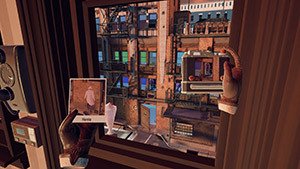 I've played many detective VR games recently, but many of them are played alike an adventure where you roam in the city trying finding out clues and progress based on your findings. The Red Stare is a more intimate and personal experience. You spy on others from the comfort of you own apartment, focusing more on piecing up the information together, rather than spending more time on movement and exploration. In my perspective, this means that the developer can spend more time on developing a complex plot and an in-depth character personalization instead of putting effort into building a complex 3D scene with lots of interaction. The graphics in this game are really atmospheric and well made. You can see that because the game focuses on a specific small area, the developer could have had more time to polish how it looks and make sure it perfectly fits the 1950s scene and make it look details and interesting to look at. After all, you'll spend most of the time in the game looking at what's going on the building and street right next to your building. The game was developed by Play:), which according to the company's website and as to this date, the company consists of 19 people, including designers, programmers, animators, environment and lighting artist designers, etc. You can clearly see the end results that a lot of thinking and work was put into this game. 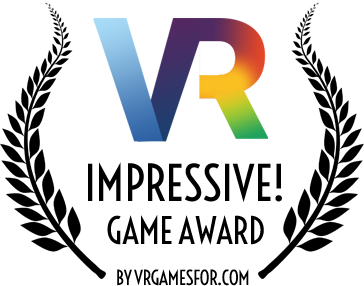 Here in VR games For, we like to spread the word of VR games that really impress us, even before they are released, so you guys can be aware of them, follow them and maybe buy them if they fit your personal gameplay style. The Red Stare easily gets out Impressive Award, and we are looking forward to getting our hands on this game when it comes out. The Red Stare is coming out on July 2017 for Oculus Rift and HTC Vive. The game requires a VR headset to play. No news or updates are available at the moment.